Nine people have been charged as part of an ongoing operation to tackle anti-social behaviour and illegal drugs use across the South of Aberdeenshire. The operation, run by members of the local policing team during Weekend Policing patrols in towns and villages across Aberdeenshire, involved Officers and Special Constables working together during the evenings of Friday September 1 and Saturday September 2. Officers targeted areas where violence or anti-social behaviour has been reported in the past. 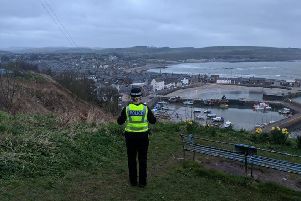 In Stonehaven four males aged 24, 22, 21 and 20 years of age were charged in connection with possessing Cannabis, while a 21 year old male was charged in connection with possession of Cocaine. Four males aged 39, 20, 17 and 16 years of age were also charged in connection with anti-social behaviour. Local Area Commander, Chief Inspector Murray Main said: “We know communities don’t want this type of criminality on their street and in their areas. “With their help and the information they are providing, we are able to target specific areas and deal with issues at an early stage, before they cause more concerns. “Our new weekend policing arrangements allow us to work smarter, often alongside our partners to reduce anti-social behaviour, nuisance and violent crime. “Taking illegal drugs or drinking alcohol to excess can make you more likely to get involved in an argument or an altercation, which could result in you or someone else being seriously injured.